a 10 foot tall door. 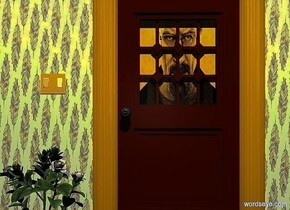 a large doorknob is -1 inch in front of and -5 feet above and -8 inches to the left of the door. a 1st 10 foot tall and 1 foot wide cream [wall] wall is -1 inch to the left of the door. a 2nd 10 foot tall and 1 foot wide cream [wall] wall is -1 inch to the right of the door. a 1st 10 foot tall and 4 foot wide [pattern] wall is -1 inch to the left of the 1st cream wall. a 2nd 10 foot tall and 4 foot wide [pattern] wall is -1 inch to the right of the 2nd cream wall. the camera light is dim. 2 linen lights are 15 feet in front of and 15 feet above the door. a 1st 4 foot tall and 4 foot wide and 1 inch deep [walter] cube is -2 inch behind and -4.5 feet above the door. it is night. a 4 foot tall plant is to the left of and in front of the 1st cream [wall] wall. a .8 foot tall and 1.0 foot wide and .01 inch deep goldenrod cube is 2 feet above and -.1 inch behind the plant. a 1st .4 foot tall and .2 foot wide painting is -4 inch to the left of and -7 inches above the cube. a 2nd .4 foot tall and .2 foot wide painting is -4 inch to the right of and -7 inches above the cube. the vehicle. the ground is tall. the huge [smoke] wall is to the left of the vehicle. it is facing right. the first enormous flat [strcmd] cube is on the vehicle. it is facing right. 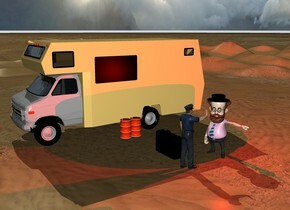 the enormous flat [dk] cube is 2 feet to the right of the vehicle. it is facing right. it is leaning backwards. the enormous flat [igliashon] cube is 3 feet behind and a foot in front of the [strcmd] cube. it is facing right. it is leaning backwards. the large fire is 14 feet to the right of the vehicle. the man is 13 feet to the right of the vehicle. he is facing the vehicle. 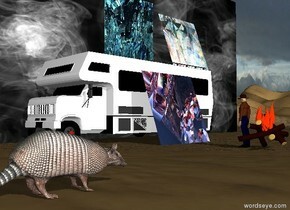 the huge armadillo is 9 feet in front and 20 feet to the right of the vehicle. the armadillo is facing backwards. it is morning.